Before you decide to dive into marketing campaigns, please be aware that they’re optimally compatible with Subscription mode. Using them with Credits can be sometimes tricky and requires little more manual intervention, however, it can be successfully used with long term campaign (over one month) saving you money in comparison with Subscription. Don’t forget that marketing campaigns are organized in sets. If you want to find out how to connect sets to user groups, check an article designated to this issue. Both marketing campaigns and sets are organized through the Marketing planner menu. You begin with empty “Set #1 (default)”. 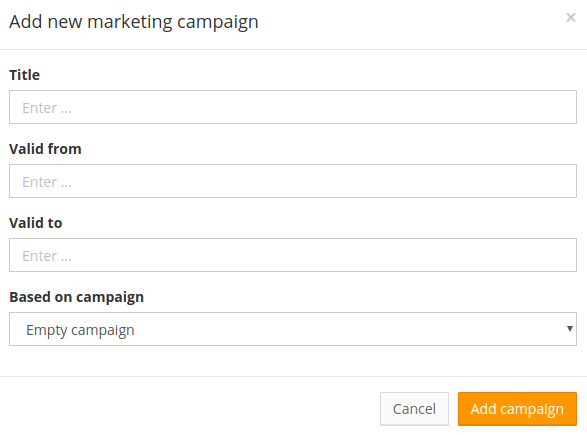 This set behaves in many ways as any other custom sets you might add, the basic difference is that it’s undeletable because it's automatically assigned to signatures that have activated marketing but not a specific campaign. Click on the option to add a new set in the top right corner. 2. You'll have an option to input the name of the campaign and date validity. This can be also changed later, so you don't have to worry about making a mistake. If you wish, you can add more alternatives of your campaign content - please check the help article. Congrats, you've set your first campaign! You can populate it in a similar fashion as a signature template. ❗ Remember, if you plan more campaigns covering the same time period, the one with shorter validity will be emphasized. If this solution doesn't fit your needs, you might like to learn more about rotating campaigns.